Big WOW! My first time in New York City! I’m a little snow bunny! I could hardly wait for March. 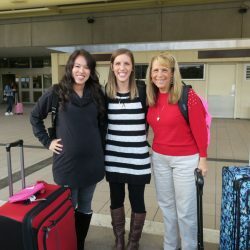 My heart flew as high as the plane as my girls and I headed off to a four-day adventure in the city that never sleeps. 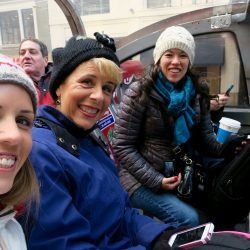 We hardly did either as we walked and tour-bussed from our hotel in the heart of the city to see the sights. Sure, it was chilly but this died-in-the-seersucker Floridian LOVES chilly! 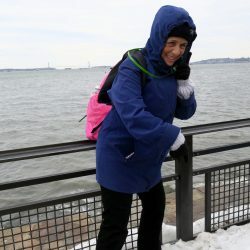 – snow was still piled up from last week’s blizzard, but despite forecasted rain every day, we saw nary a drop until we were ubering along to the airport to come home. 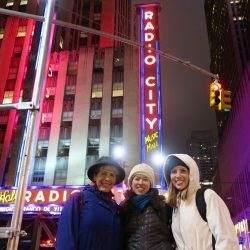 In no particular order, we saw Radio City Music Hall (home of the famous high-kicking Rockettes). 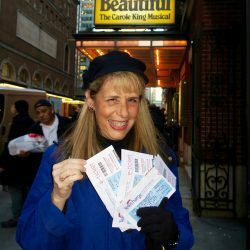 Then we mingled with the throngs on Broadway, where I sang along at the top of my lungs to every single awesome song in the Broadway musical, “Beautiful,” all about the life and songs of my teen “Tapestry” idol, Carole King. “You got to get up every morning, with a smile on your face, and show the world all the love in your heart … people gonna treat you better, you’re gonna find, yes you will, that you’re beautiful … as you feel! ” You’re singing with me, aren’t you? Such GREAT songs – what’s not to love? Love those double decker tour buses! 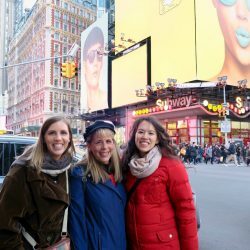 We visited Times Square, where street performers entertained and gigantic billboards flashed their messages all around the spot where we watch the ball descend every New Year’s Eve on TV. 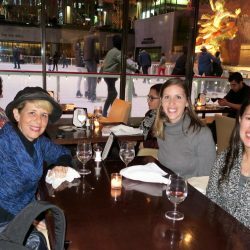 Dining at Rockefeller center was a blast – we were seated beside a huge glass wall where we could look out at the ice skaters spinning and twirling and busting tushie as we enjoyed delicious hot soup and sandwiches and sipped hot tea. 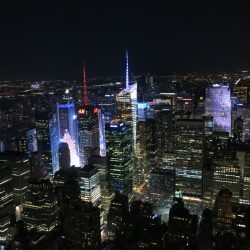 We did the Empire State Building experience at night, where it was hard to say which blew us away more – the wind or the incredible view of sparkling Manhattan. What a wonderful time we had! 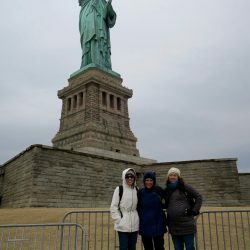 Of course there was the Statue of Liberty, and Ellis Island to tour, both most enjoyable with my chicas. And you can’t go to New York without seeing the World Trade Center Memorial; I fought tears during this moving, almost spiritual experience. Then, it seemed we had hardly arrived for our perfect vacay when it was time to go. Everyone got that message but the airline pilot. 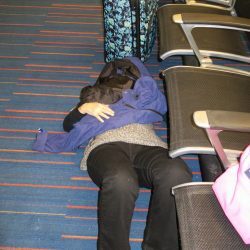 After a full day of doing New York, we arrived at the airport two hours early for our flight, only to be told, at the scheduled time of departure, that our plane hadn’t even left Orlando; it had yet to fly the three hours to NYC, unload, clean up, and board us for the three hour flight back to Orlando. S’always something, isn’t it? 7 hours in the airport. Ugh. Many hours later (felt like days) I finally arrived home at 6 a.m., exhausted, but treasuring a bouquet of priceless memories. So I hope you don’t mind me sharing some of them with you. Have you been? To NYC, I mean. I’d love to hear about your juicy bite out of the Big Apple too! 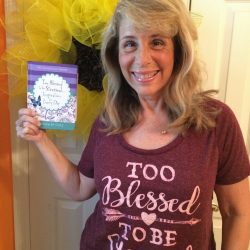 A Too Blessed to be Stressed shirt just like mine in the photo. Say, we can be twins as well as BFFs (Blessed Friends Forever)! But don’t put off entering – the drawing will be held on Good Friday and the winner will be announced on Facebook (are we friends?). Doing our NYC vacation in June 2017. Looking forward to all the same sights and sounds as you experienced. You had such a good visit. Want all your giveaways too! My favorite Easter activity is getting up extra early for the “Son Rise” service at church. I am not a morning person but this I can not miss. 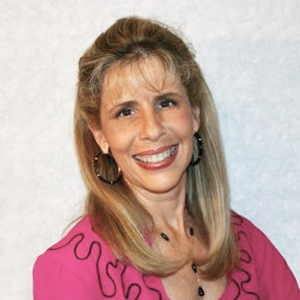 Listening to beautiful, Christ honoring music and enjoying the wonder of Easter Morning contemplating on what happened that special morning many years ago! Hearing one of my favorite scriptures. ” He is not here but is risen as He said” PTL! Realizing it is not about the bunny but the Lamb that lay down His life for us all! There is no sweeter time on earth.